Yes I tried all that stuff already....Re-download drivers. Double-triple-check ports, drivers in root directory. Both the AMD and the GRAID RAID utility see the drives and build a RAID without problem. 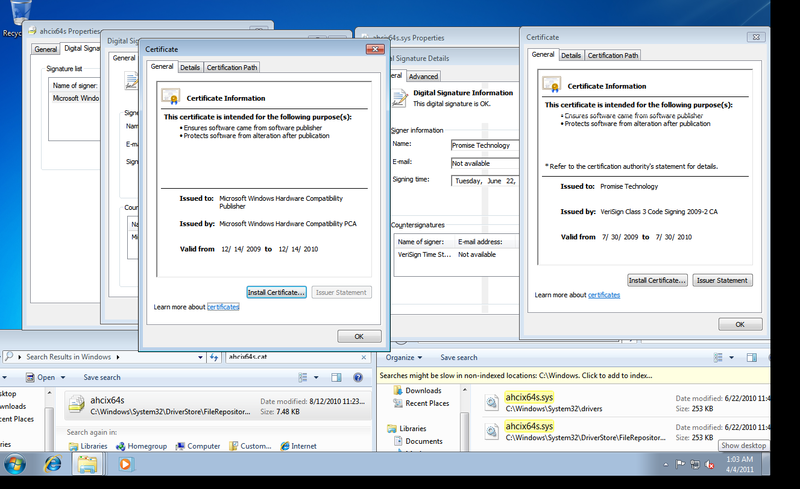 The Windows 7 64bit installer throws a fit when it finds drivers with expired signatures. Last edited by phosphene; 04-04-2011 at 12:37 PM. OK, so can you press F8 before the install and choose to use unsigned drivers during the install? Are you sure your media (Install CD) is not messed up? Can you maybe reburn it again at the slowest setting to be sure? I have NEVER Seen this during an install, only afterward, and didn't think it mattered at all during install because the UAC and driver signing features were not on yet. Upload for me a single driver that you know causes this for you, I can't test RAID but I will attempt to load the driver during a x64 install and see if I can reproduce the error in a virtual environment just by loading the driver. Then maybe I can see a further indication of the problem in some logs. Actually, I think I just solved this for you! You said the date is indeed correct in your BIOS right? If so, it would seem to me that maybe your DVD drive or the install media is messed up I think, because I would expect even if this driver was not used loaded on my end that it is still installed when I choose to install it, and I do not get any errors. I am about 99% sure it loads and is part of the install process because in the past I have loaded Marvell drivers before an install but used the Intel ports (So drivers not used same as this) and the drivers were indeed installed during the install process even though they were not used at the time. Install went fine and drivers were loaded into the install process, without driver signing disabled during the install too, so I think something is wrong with your install CD or method of driver loading (IE Bad USB or ???)? 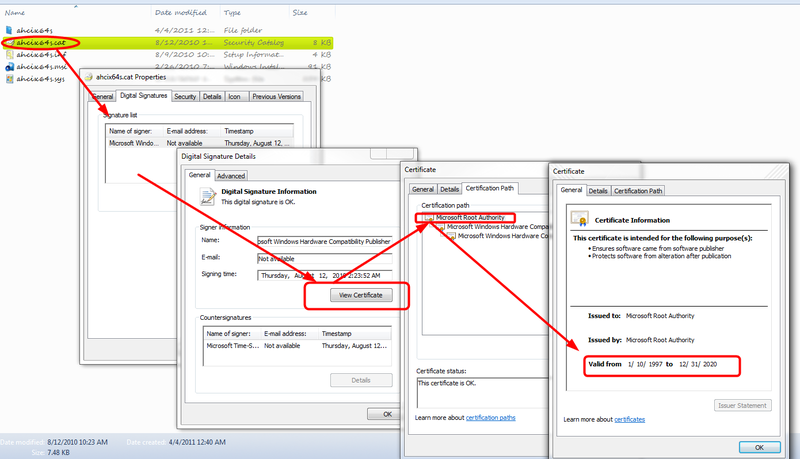 I dunno what it is man, but it works fine here and loads with or without driver signing enabled/disabled without an issue, and you are right the driver signature date is old. 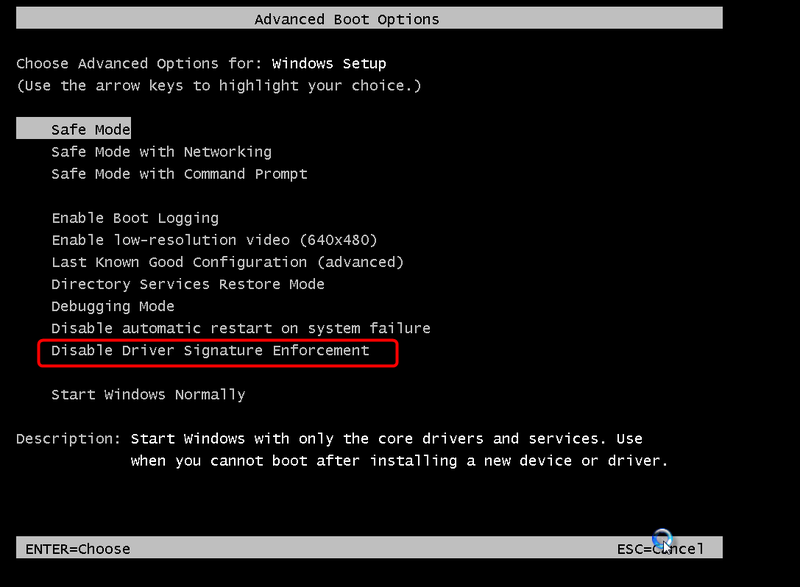 Go ahead and see if you can get it to install using F8 and disable driver signing enforcement, that should be a valid work around to install with if needed. 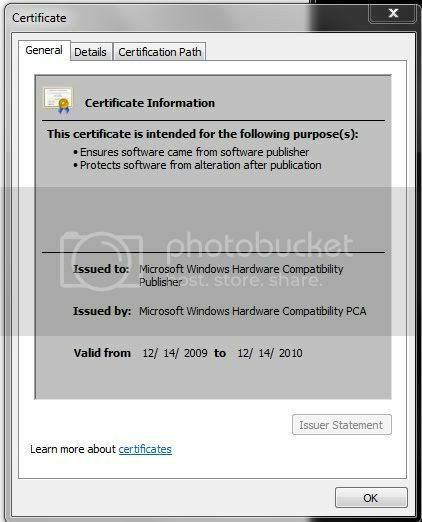 This got me curious, so I looked at my Intel RAID drivers, and those certificates expired in February but they install fine too? Then I noticed the "CounterSignature" at the bottom section and looked at the Intel one and then you file, and they are way later dates. 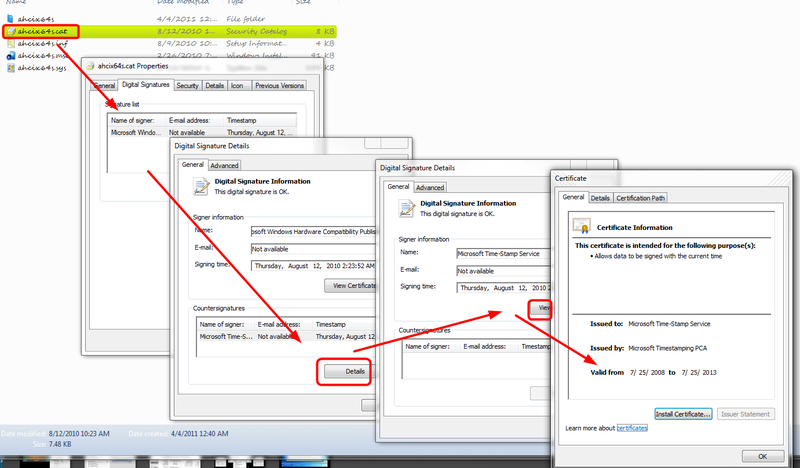 See, here is the dates on the Counter signature of your files, not sure which signature counts though, or why there is more than one signature or dates (Try 4-5 dates across all the various signatures), or what we do after all of these dates? Or for that matter, why any of this matters and or why they would make such a lame thing on a driver that they know users will be installing for years? I also see this on your files, the root authority signature date is 2020! Last edited by Lsdmeasap; 04-04-2011 at 01:29 PM. Bad flash drive might be a good theory. It did seem to be read/writing slowly. I'll have to go get a new flash drive and try it. Although, the 64bit GRAID drivers loaded fine(were the only drivers that would load). I have my RAID configured through the 2 GRAID ports right now. 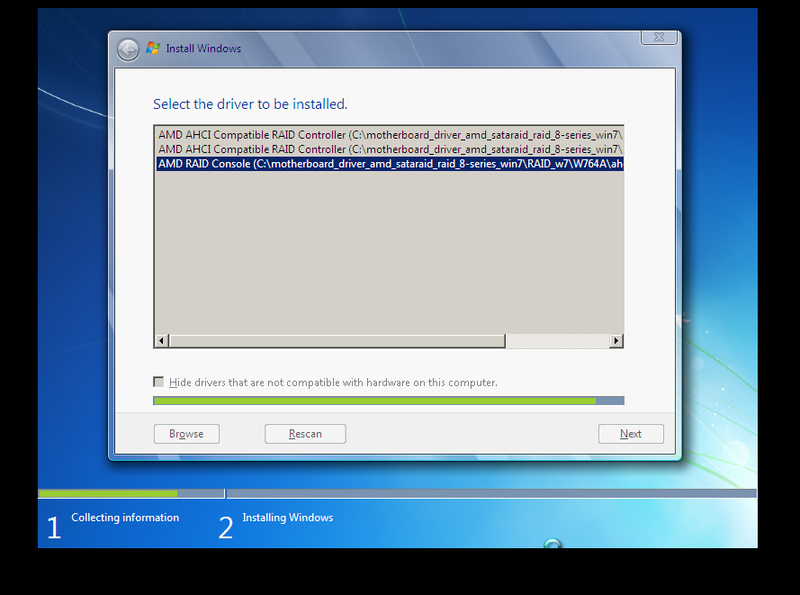 Its just the AMD RAID drivers that the Windows installer doesnt like. And both the GRAID RAID utility(cntrl-g) and the AMD RAID utility (cntrl-f) see my drives and configure the RAID without a prob. Last edited by phosphene; 04-04-2011 at 03:45 PM. Ahh, so what happened when you try F8? I installed both ways, an no problems either way. GRAID is terrible, so ya you want to get off that asap! Something is wrong with your USB maybe, or the install DVD? 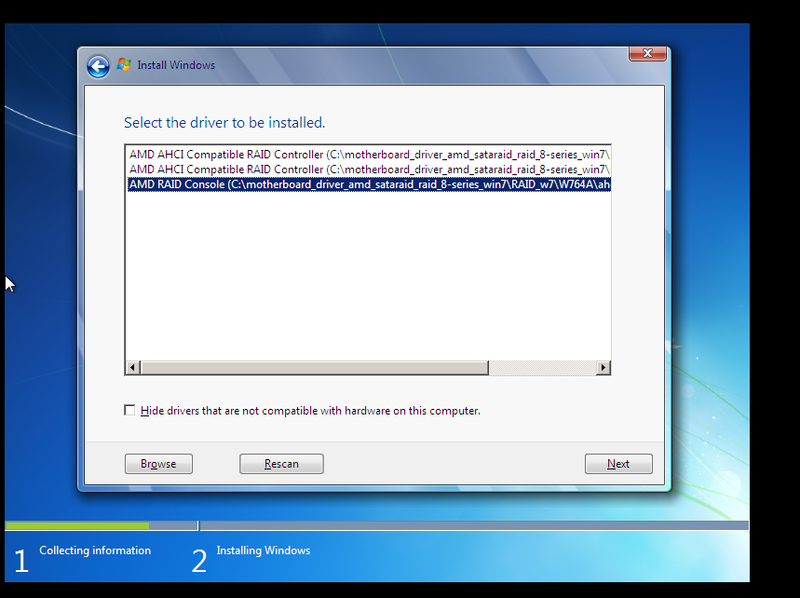 Something, cause it's no problem here to install and no complaints about the driver I linked above. GRAID is terrible, so ya you want to get off that asap! Yes, I suspect that all my instability problems are because the OS drive is on the GRAID ports. Itd be nice if the other drivers worked for me, so I could test that theory.